2008 is a truly horrible year for the makers of Peeps and Cadbury Crème eggs. Easter has come earlier than it has since 1913 or it will again until 2160 (according to Snopes). Easter falls on the first Sunday after the first full moon after the vernal equinox, a piece of trivia I learned just so I can impress people with an obscure piece of trivia. These events all occurred one day after another this year, hence we’ve got an early Easter. I suppose this is good for my weight since Easter candy is by far my favorite seasonal candy. But I did freak out a little last weekend when I looked at my calendar and realized I had less than a week after St. Patrick’s Day to partake in my annual indulgence of one box of Peeps and one caddy of Crème eggs. So I grabbed some on my weekly trip to the grocery and they were indeed good. It’s down 5g. I don’t know if they take that out of the chocolate or the gooey fondant center or both. Even more shocking, this happened last year! And I didn’t even notice! Why didn’t anyone mention this to me? Y’all really let me down on this one. At first, Cadbury denied that the egg had gotten smaller, saying instead that, “It hasn’t – you’ve just grown up!” They’ve now updated their FAQ page to explain that the egg is the same size it’s always been in Europe and Canada, but Americans are at the mercy of Cadbury’s business partner, the Hershey company, who decided to shrink it. Normally, I am a fan of smaller portion sizes, however that’s clearly not what the shrinking egg conspiracy is about. There were no ads promoting the smaller eggs as lower calorie or easier to stuff entirely in your mouth. This was done on the sly so they could keep charging us the same price for less product. This is evidently a common practice. I learned about the smaller egg size from a story on ABC News that revealed that the same thing is happening with everything from toilet paper to yogurt. I noticed a couple years ago that my yogurt cups shrunk from 8oz to 6oz while staying the same price. Who knows what else they’ve switched on me? I’ve funny that fast food restaurants have increased portion sizes on cheap food products like 64oz tubs of soda pop, yet other products are silently shrinking on the grocery store shelves. Sadder yet, there’s not really anything I can do about it, besides importing Cadbury eggs from Canada. So,um, happy Easter everybody! If you live in Canada or Britain, stuff one of those huge crème eggs in your mouth for me, will ya’? This is what I’ve been complaining about all along. Not about candy getting smaller, but I too noticed the yogurt cups. I love yogurt and one day I went to restock and noticed that all the cups seemed smaller. I checked to see what the ounce’s were and low and behold, it was 2 less. I was not happy about this, but I was also not surprised. With the price of corn(which is used to feed the dairy cows) so high because a bunch of idiots think its better to make low quality fuel than eat, products that use dairy have to go up in price. Don’t get me wrong, I’d love to see America stop using oil and tell OPEC and all the filthy countries in that cartel to bite it, and to use renewable, cleaner fuels, but ethanol is just not it. Anyway, my original point, the healthy food just keeps getting smaller and more expensive while heart clogging crap keeps getting bigger and cheaper. We wouldn’t need commie health care if we could afford food that wasn’t killing us. This ones for you PQ! I am weird… I don’t like Cadbury Creme Eggs. Give me a Reese’s Peanut Butter Egg every time. Already had one for this year though and enjoyed every bite! It’s as well my grocery store started displaying packages of six rather than the individually wrapped PB eggs… or I’d have been tempted to indulge on every shopping outing. I have indeed eaten a Creme Egg today. Mmmmmm. I can confirm that they’re the same size they’ve always been here. I’ve still got three left, and the shop on the corner has plenty: I could send you some. Do you think they’d survive being posted? The mini Creme Eggs are just not as good in my opinion. The goo in the middle isn’t as liquid and tends to be grainy, alas. I agree with Joshua’s opinion of ethanol, but yogurt cups got smaller years and years ago. I remember being fooled one day, thinking I was getting a bargain. Yoplait was one of the first brands to do this, but most others have followed. I only by yogurt by the quart now and usually un-flavored, so I can control the flavor and calories and sugar content myself. Did you know that maple syrup and vanilla can recreate one of the best vanilla yogurts? Any fruit or berry or combination of these can be cooked in a bit of sugar and added to the yogurt for a flavor. PQ – Oh my God, that is awesome. It doesn’t bother me they srunk em, I’ll still be addicted to them! I am from Canada. I had just one this Easter, which is a miracle in itself. It was wonderful. I wish I could have given you one. You are so right about the egg!!! I didn’t notice it on that level, but did notice that when I ate one this year it went faster but didn’t seem as rich (because there was less to eat!). 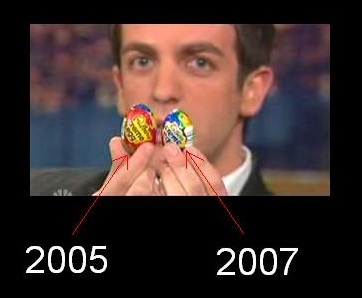 Candy shrinkage is a big time conspiracy. Did you know that the “one pound” bag of M & M’s has shrunken down to something like 10 or 11 ounces? Utter crap. I actually thought of you the other day when I was in my local CVS surveying the (sadly depleted) Easter candy selection. I’m probably weird, but I never in my life have eaten a Cadbury Egg. And I didn’t end up buying one, either, because I already have too many other Easter candy addictions (white chocolate bunnies, Reese’s peanut butter eggs, Whoppers Robin Eggs). It’s bad when I know about things that are very, very good. It takes all kinds… I can’t STAND Cadbury eggs. The filling is so damned sweet it makes my teeth ache. Can’t say I like any other kind of Easter candy either. I hate peeps. But if I going to buy the darned things, I definitely want my money’s worth! I’m with you Marla, that ‘crème’ is the sickliest-sweetiest-yuckliestest-sugary-gick ever! I just can NOT eat it. yuk. My solution was to eat two… at the same time. Look away from me, I’m hideous!!!!! I used to eat Wagon Wheels (the marshmallow chocolate treats) when I was a kid. I had one the other day for the first time in over a decade– maybe even two decades. The Wagon Wheel has shrunk to what appears to be half its size in the 80s. Chef Boyardee- again, I had a can of the Ravioli for the first time in years- and clearly noticed there is a lot less in the can than there was even 10 years ago. McDonald’s Big Mac– just look at how small this ‘burger’ has become over the years- shrinking ever so slightly. Fruitopia fruit drinks- this year, their new package size is 450ml instead of last year’s 473ml. The package makes no mention of this– it only mentions it when there’s an INCREASE of size. Oh, and an increase in price, too. Of course there’s something going on. We are getting less for more. Period. If anyone thinks we live in an honest world and that there is nothing going on behind the scenes or behind our backs or if people believe our best interests are at hand and that we are always told the truth and nothing but the truth, then the whole ‘plan’ in working. I’m not in that group- we are at the mercy of these huge corporations that deceive and lie to us and tell us what we like to hear. They don’t tell us that their cigarettes kill us or that the new high-caffeine ‘energy drinks’ will rot our kidneys in 10 years or that the price of a family-sized pizza has increased 40% in the last 5 years or that they have shrunk their packages– they tell us things like “NEW! Bigger size!” or “IMPROVED FLAVOUR”!– yeah, improved flavour means MORE SUGAR which will also destroy our insides as well– but nope, they don’t tell you that. hey, they can only shrink package sizes so much.. what’s next? Holy cow, Starbird, I just tried mixing flavor into plain ff yogurt an hour ago and needless to say, I ended up adding a couple tablespoons of sugar with the imitation vanilla because it just wasn’t turning out very well(BLECH!!). Would you mind sharing the measurments for the vanilla and maple syrup? Thanks. What color and shape of peeps did you eat? There is something about the plain yellow chicks that can’t be topped, intriguing as all the wild colors and variant shapes are. I don’t remember what color they were for sure, but I think they were yellow. Definitely chicks. How funny…I bought a four pack of creme eggs and didn’t even realize they were smaller until I read this, and then it was obvious. I don’t think I mind that much, since I mostly eat them for nostalgia factor rather than that they are particularly good (though I do love me some sugar) and the current size is plenty to get my creme egg hit. Tampons… they shrunk tampons about 5 years ago. You get less in a package (the 40 pack went to either 32 or 36?) but the price did not decrease. Playtex and Tampax are both guilty of this one. And they are using more synthetic fibers and cutting back on cotton to save them money, too. Any other ladies notice this one?? I thought those Creme eggs were smaller! I always bite the top off, eat all the creme out of the middle with my pinky and then eat the hollowed out chocolate shell. It used to take longer to finish all that. And as mad as I am about the shrinking size, I will continue to stock up on them at Easter every year.